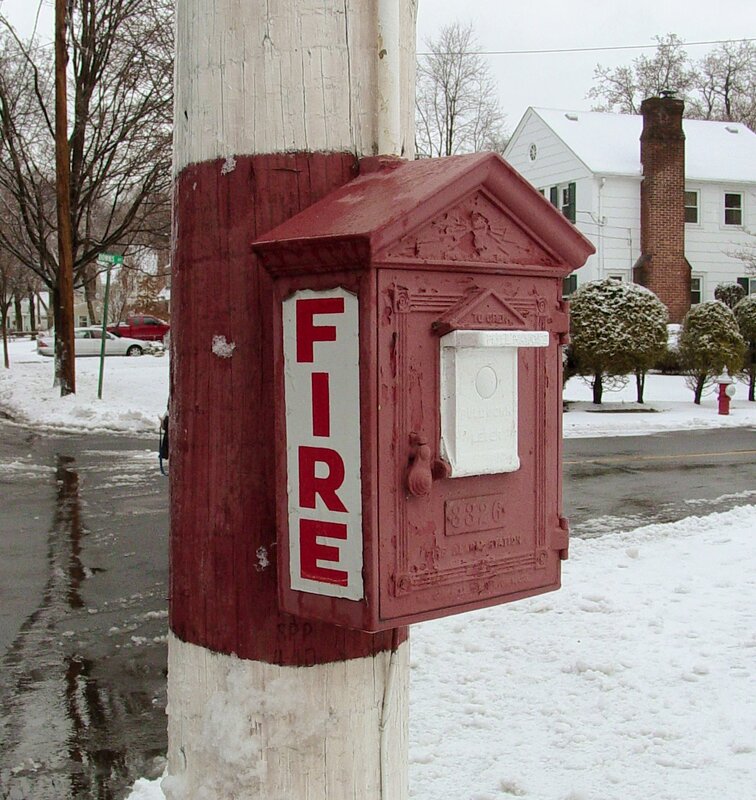 In a world before text messages, the internet, televisions, radios, and even telephones, fire emergencies were signaled with fire signal boxes. Not everyone could signal a fire. Fire signal boxes were locked, and alarms could only be activated by keyholders. Alarms were to be activated from the box located closest to the fire. Keyholders confirmed that a fire was indeed burning before activating the box by unlocking it, pulling down the slide or hook inside once, and letting it go. After activating the alarm, keyholders listened for the bell inside the box to begin ringing, which indicated that the fire alarm signal had been successfully sent to the fire department. If no sound came, keyholders pulled the lever inside the box again. And if this didn’t work, the keyholder moved to the next closest box and tried again. If the bell inside the fire signal box was ringing before the hook was pulled, this meant that the alarm had already been given at another box. Once the bell did ring, the keyholder remained at the box until the fire department arrived and released the key. Keys were never to be lost, or turned over to anyone other than the fire department‘s chief engineer. Police also had keys to the boxes. 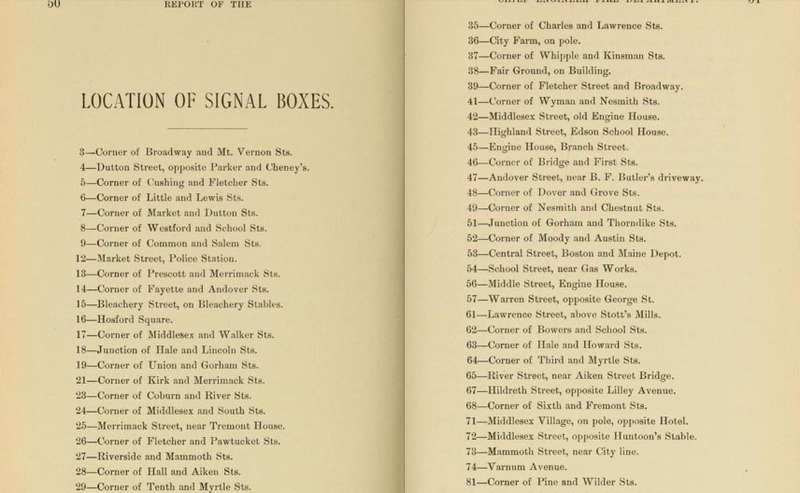 Each station of the fire department was assigned a set of fire signal boxes that it was expected to respond to, but the department’s chief, first assistant, and protective company were expected to answer all alarms, regardless of which box they were sent from. When the alarms were signaled, any companies not responding were asked to remain at their houses for at least thirty minutes unless they were dismissed by telegraph signals. To a society where telephones were new and untried technology, and other forms of twentieth-century communication technology were still decades away, fire signal boxes served as a lifeline to the city’s fire department. The signal boxes provided citizens with peace of mind. When they were in need, the boxes were the quickest and easiest way to reach help. However, beside providing help in emergencies, fire signal boxes also provided a service later offered by radio, and more recently by TV and the internet. They were used to announce the cancellation of school sessions. Two strokes at the fire signal boxes, repeated three times at 7:45 AM, or at 1:15 PM meant that the following session of school was cancelled. And, they also helped people set their clocks. The bells were struck once daily, at 1 PM. Hi Ryan! I remember coming across these when researching the career of my 2nd great-uncle James F. RYAN, who worked for the Boston Fire Dept and became a district chief. I wonder how they worked?